The Illustration Work of Louise Byng as seen from Earth. : Hello, World. 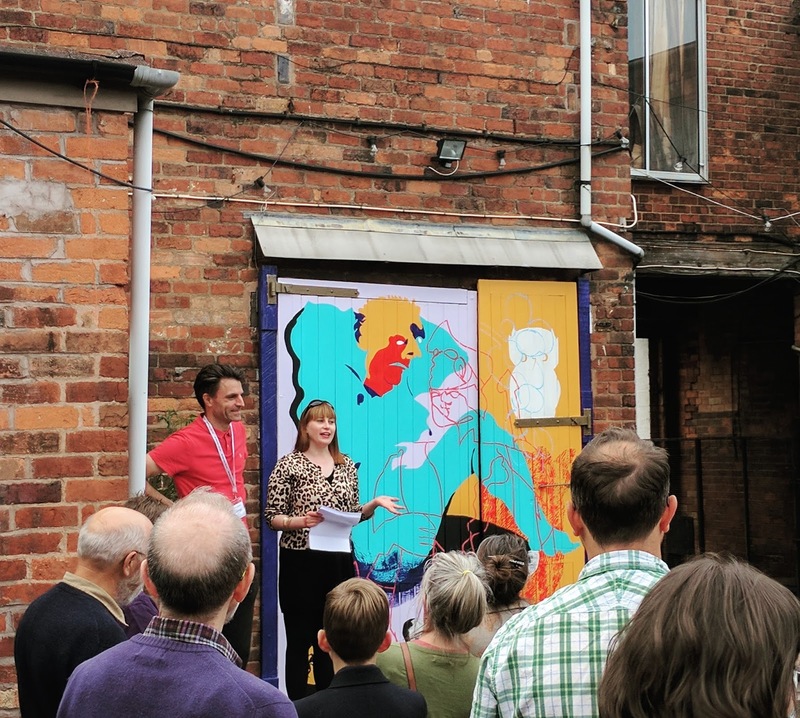 Back at the end of April, theatre company Stan's Cafe called out looking for artists to paint their performance space doors and my interested piqued. Whilst not having made any artwork that needed to exist outdoors before, Laurie & I put together a snazzy .pdf portfolio of our works, with a focus on storytelling rather than relevant mediums (largely because we had so few examples) and sent it across. 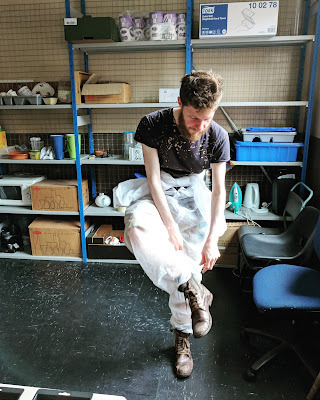 We were stoked to be invited to chat further, and exploring the co's store full of artefacts from past shows left me inspired, with a huge sense of kinship that went beyond my previous appreciation for their powerful works like Of All The People In All The World. Following that we went away and spent the night pulling some ideas onto a mock up of the doors, sculpting the story that we wanted to tell using blind contour drawings and silhouette shapes. The next day we went along to A E Harris (finally starting to know the way with maps) to present our proposal. After we explained everything that was in our heads, the Stan's team, made up of James, Craig, Roisin & Laura, were largely silent, asking only a couple of practical questions. We left totally divided about what they may have been thinking inside those wonderful skulls, so when we got a call later that day saying it was unanimous, I still wasn't sure if this was a good thing or a resounding no ta babs. Much to our delight, our idea had been chosen to don those dishevelled doors. 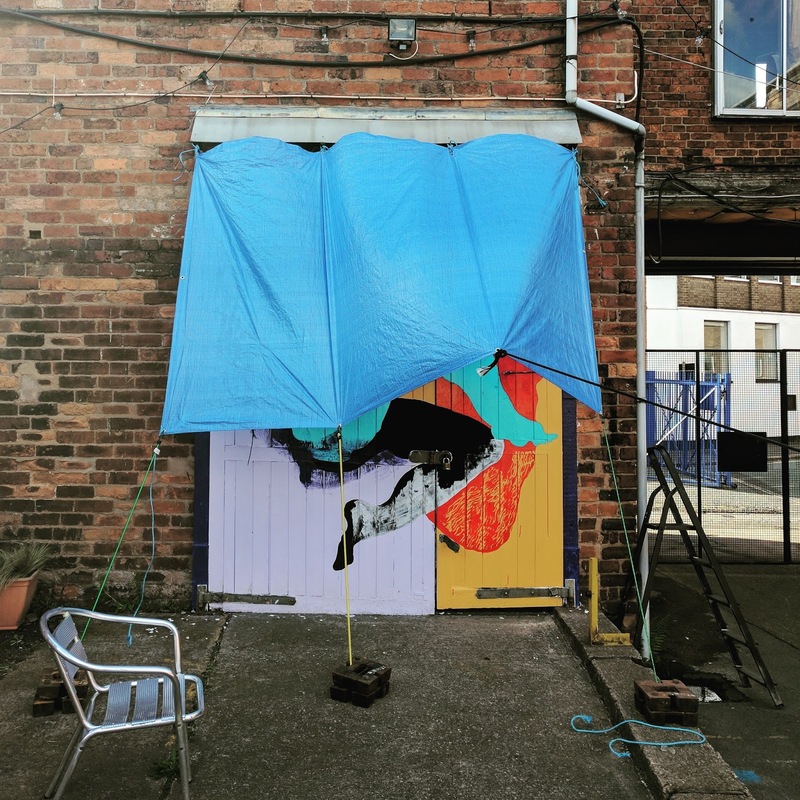 Across four sessions in at least four different types of weather (windy tarp, hot tarp, wet tarp, cold tarp +) we plotted, prepared and painted the mural in a short space of time, needing to give the doors their licks of paint in time to be revealed at the Stan's summer party. Translating the design to the scale required was a new challenge, and we used chalk lines and trusty pencils to get everything in place before getting stuck in with both matt and weathershield gloss paints, building it up in layers naturally planned around the latter's extensive drying times. The final design was unveiled at the party to lots of lovely Birmingham revellers along with a deeply tired pair of paint-splattered artists. A feeling of relief and pride finally began to ooze out of my pores, slowly but surely. In case you were wondering, the design is an interpretation of two Greek mythological figures: Dionysis - patron of theatre, ritual madness, religious ecstasy and wine - and Athena - goddess of wisdom, craft, poetry and diplomacy. 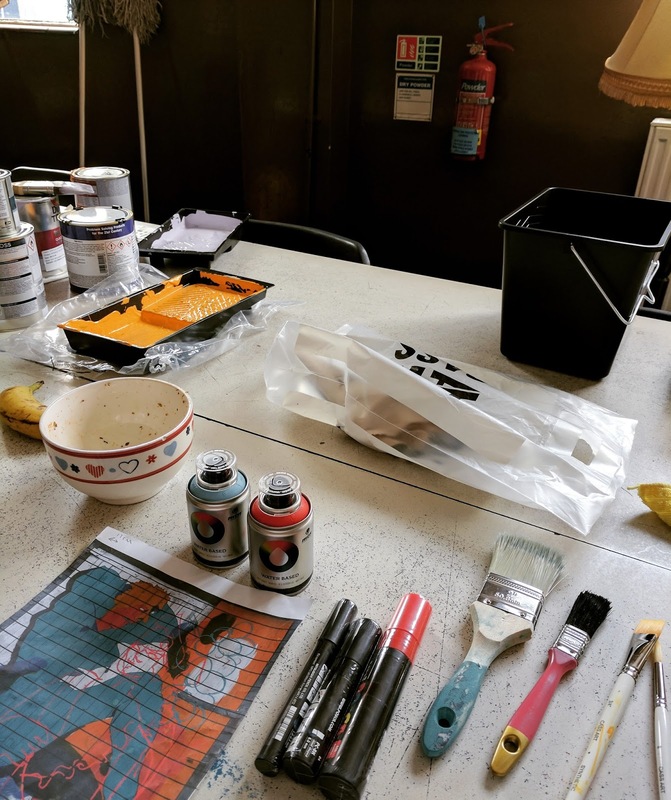 The sum of these parts went some way to describing some of the things we see in Stan's Cafe as a company and the uses of their space; a place for hard work, celebration and creative expression. Dionysis and Athena were siblings, and the story goes that Athena saved Dionysis' heart after he was killed in a brawl, perhaps demonstrating the relationship between chaotic creation and calm order; manifesting at Stan's as the resilient structure and genuinely nurturing team that protect, house and, essentially keep raw artistic work alive. 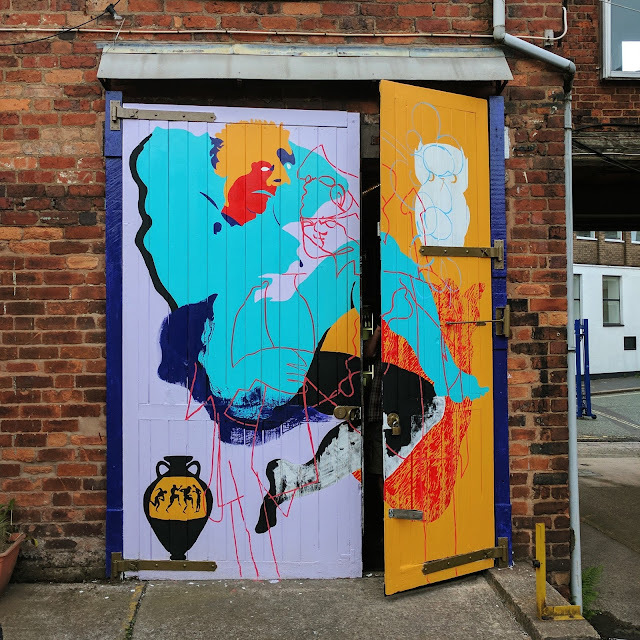 If you go down to JQ make sure to say hi to our new Greek friends in their vibrant home. Huge thanks to Stan's Cafe for boldly commissioning us and trusting us to bring this to life. It was amazing to be allowed to play on this scale and make something unique inspired by the venue, the work, the people and, of course, the oscillating tarp. As for the oscillating tarp inside my mind, starting to look back on this work and more already feels like the gentle unfurling of the first guy rope needed to throw the whole thing off so I can see the sky. Thank you for reading.